Our organization is engaged in offering its clients with Galvalume Color Coated Sheets. 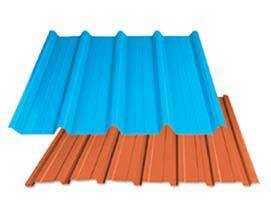 These sheets are manufactured using quality material and in line with requisite industry standard. These are available in the varied thickness and designs, thus, finds wide acceptance among our clients across the nation. Long life expectancy and resistance to corrosion. The sheets dont crack on exposure to sun and weather. Can be retrofitted on existing roofs. They reflect the heat and sunlight and hence contribute to energy saving.